Weekdays: 5:40. Wake up. Shower. Makeup. Hair. 6:10. Pack lunch. Eat breakfast. Get dressed. 6:40. Walk to the bus stop. 7:30. Arrive in the city. Walk to work. 8:00. Sit down at desk and start the day. 1:00. Maybe take a lunch break, maybe eat at desk. 5:30. Walk to the bus while calling mother. 6:00. Sit in traffic. 7:00. Eat dinner. 8:00 FaceTime friends and boyfriend. 9:00. Collapse into bed and read. Repeat. Saturday: 7:30. Wakeup. Browse social media. Eat. Shower. 9:30. Go out with boyfriend for the day in the city. Sunday: 2:00. Get on the train. 2:30. Get picked up. Go to the market. 3:30. Get home. Freshen up. 5:00. Meet up with a friend for dinner. 8:00. Arrive home. 9:00. Collapse into bed and read. I have a strong feeling that many of you will look at this schedule and think to yourself, "Yep, looks about right." We're no strangers to packing our days with appointments and work and hanging out with those we love. But so often we are missing essential time to ourselves. The precious hours to browse our favorite blogs or take a walk or just exist with the absence of an impending "next thing to get to." Very quickly we get to the point where we don't have a single second to reset and relax, leading to exhaustion and lowering our ability to be effective in our work and present in our lives. Especially if you're in the same boat as me with a good amount of travel (my schedule above didn't reflect those weeks where I'm flying, too! ), it is impossible to maintain this pace without there being consequences on your performance. This doesn't have to be an inevitable cycle. Instead, by evaluating how you spend your time and what actually contributes to your life you can guard your time and insert necessary whitespace. While I am extremely good with being a minimalist with my possessions and online life, it's a lot harder to admit that I can't go, go, go 24/7 and actually need some time to rest. Here's how I have started to come to make adjustments. There's no denying that I live by my calendar, but being a slave to your schedule isn't beneficial. In fact, it's downright damaging. Start by taking a look at what you do on a daily basis and determine what is contributing to your personal growth and happiness. Figure out if the rest can be eliminated (I know that picking up dry cleaning isn't making you a better person, but there is some stuff that is necessary, even for a minimalist) and make adjustments accordingly. I've already written an extensive post on making the most of your commute, and can't stress enough how important it is to make the necessary parts of your day work for you. You can also get creative by rearranging and merging your calendar. For example, I normally wait until I get home after work to call friends, but have recently started to walk to a park and FaceTime them during a lunch break. Yes, I've actually started to take my lunch break (sometimes...) because the fact of the matter is that working relentlessly without taking a break damages my productivity and effectiveness and isn't worth it. I decided that every weekend I needed at least one morning or afternoon to myself. No meeting up with friends. No running errands. No expectations. During this time I do whatever I feel like, which is most often writing in my journal or reading or blogging or going in circles on the internet. This is my time where I can reset my mind and do whatever my heart desires and it's glorious! Maybe you need a whole day or just an hour, but we all need some solo time and if you have to schedule it, so be it. While some weekends I can't find the time, or end up making plans despite my best intentions, I try to come home a little earlier or say no to an after work activity during the week. It's hard to stick to 100% of the time, but when I do carve out that alone time I am happier and more well rested. I have a feeling you will be too. 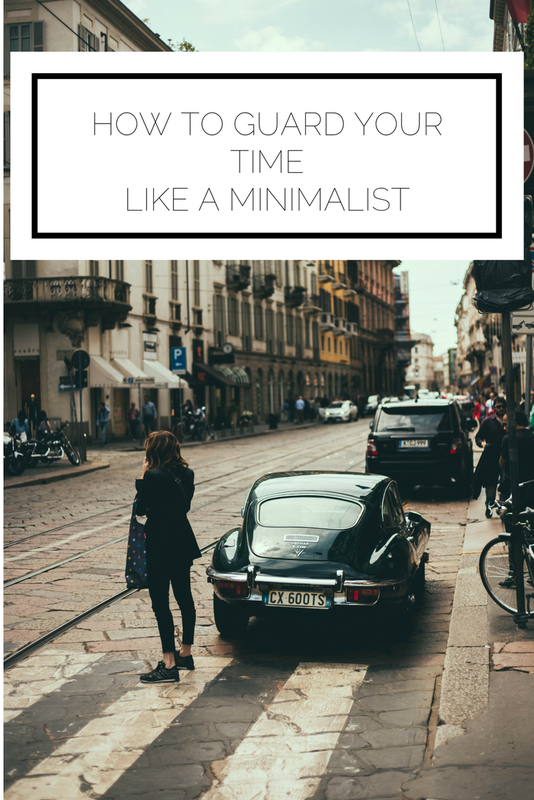 Embracing a minimalist mindset for your schedule (does this actually improve my life? why am I spending my time on this?) takes some getting used to, but helps you to be a happier and more effective professional, friend, daughter, girlfriend, person. How do you make time for yourself? What helps you to stay sane and recharge?